Yarn: Because this hat is knit starting at the top and working your way down to the size you want it to be, things like gauge and yarn weight are fairly open for whatever works best for you. I used ~110 yards of my own (heavy worsted to bulky weight) Confetti handspun yarn, and this included plenty for a generous tassel. Needles: I used US size 10 dpns, and eventually wished that I could find my circular in that size. You should use the needle size that will work best for the yarn you are using. I'll bet that you are more organized than I, and you can find both your circs and your dpns, you fancy pants. I thought about going down a needle size to make my fabric tighter and the top of my hat stand up straighter, but opted for a needle size that would create more drape in my fabric and a more flopsy kind of hat top. My gauge (and yours can differ): 4 sts, 6 rows= 1 inch. My finished measurements: 11 inches from point (not including the tassel) to brim, and about 17 inches around the brim, big enough for my head, and with a healthy amount of room to grow into for my six year old's. Remember, there is lots of room for interpretation here; your hat can be as big or as little as you want it to be. To get started: CO 3 stitches and place place each stitch all alone on it's own dpn. Knit the 3 stitches, joining them in the round. Round two: Increase the first stitch on each needle (I just knit into the front and the back of the stitch) so that you have 6 stitches total, with 2 on each needle. Round four: Increase the first stitch on each needle again so that at the end of the round you have 9 stitches total with 3 on each needle. Keep going, knitting and increasing on alternate rounds. Or, you may want to make every round an increase round if you are using a lighter weight yarn or if you want a shorter, less triangular top. You can play around with the shaping a lot here. It took me 44 rounds before my hat looked big enough around for me to stop increasing. At this point I had 72 stitches on my needles and my hat measured 6 and 3/4 inches from top to bottom at that point. This is the part of the recipe where you will either need to eyeball (my usual M.O.) or measure your gauge and do the math to figure out what will fit your recipient's noggin. Once I guessed that I had increased enough, I knit another 2 and 1/2 inches (15 rounds or so) and then began a knit 3, purl 2 ribbing (to do this I had to reduce 2 stitches.) After an inch and a half or so if ribbing, I bound off 23 stitches, put 12 on a stitch holder, bound off 23 more, and left the 12 stitches remaining on a dpn. You could certainly bind off all your stitches at this point. You can always pick up stitches and add some flaps later on if your feelings change. If your gauge is rather different from mine, you will need to do a little bit of math to work out how big you want your earflaps to be (mine start out being 3 inches across and are about 3 inches long) and how you want them placed on the hat. Knit 4 rows in garter stitch. On your fifth row: K1, sl 1, psso, K to last 3 sts, K2tog, K.
Last row: K2tog, K1, 2 stitches remain for i-cord ties. I-cord for 10 inches or to desired length, bind off, weave in ends, top with tassel or pom-pom if that's your thing, and go, keep someone's head toasty and warm! ****edited to add: you can now Rav my pattern here! thanks for sharing your "recipe" aprill! it really is super cute. i know some babies who could use a hat like that. Omigod! So adorable! 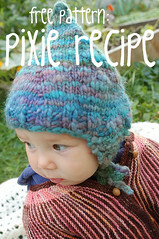 Thanks for sharing the recipe - although I think the ingredients make that particular hat! I have some of your handspun still in my stash - may have to bust it out to knit one of my own! This is a Flickr badge showing public photos from lulubeans. Make your own badge here.